Visit Alaska for a winter photography tour in the so-called off season and you’ll be wowed by a variety of wintery subjects. It’s a magical time in Southcentral Alask, with pristine snow fall, enchanting light and plenty of great subjects, like powerful landscapes, seasonal events and northern lights. This period delivers amazing scenes summer visitors never see. Added bonuses for taking an Alaska photography tour in the “off-season” include discounted winter rates for accommodations, opportunity to mix and mingle with the locals for a more authentic experience, and easier wildlife spotting once leaves drop. Plus, Anchorage’s location on the Cook Inlet Coast provides a maritime climate that’s much milder than the North Slope and Interior regions of Alaska. In fact throughout much of the season, Anchorage is warmer than the Midwest and upper New England, with an average winter temperature around 24° F [-4.5° C]. 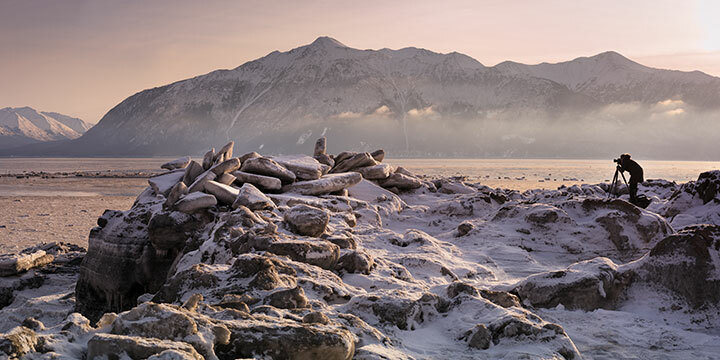 For an outstanding Alaska winter photography tour option, check out Twilight Photo Tour. You’ll experience 4 hours of touring through sunset and the blue hour, to a variety of locations around the scenic Cook Inlet Coast, Turnagain Arm and Chugach State Park. Is seeing northern lights on the top of your bucket list? We can help make that happen in the most comfortable and cost effective way possible! Anchorage Aurora Quest travels to a variety of scenic dark sky locations within a 70 mile radius of Anchorage. Northern lights are a natural phenomenon affected by earth and space weather, but by using modern technology we’re able to significantly increase the odds of success.